Many people take a liking to this culture and language because of their wedding ceremonies. The bride and grooms closest family members will get together to discuss the wedding and most importantly, the lebola. What happens here is the bride’s family, normally her mother and father, request certain items from the groom’s parents in exchange for their daughter. The items that are normally asked for are things like money and livestock, but they can literally ask for anything. If they would like a bottle of brandy, they can ask for that, or a television, whatever they ask for, the groom’s parents cannot refuse otherwise their son may not marry whom he wishes to marry. A Sepedi wedding is not held at a church, but rather at the bride’s or groom’s home. When the bride is dressed and ready for her wedding, she has to go to the river and collect enough water and wood for the ceremony. Her dress will be made from a cow’s hide and is called a Dintepa; the groom can wear a suit for the big day. When the bride has collected enough water and wood and completed her other tasks, she is now ready to walk to her husband-to-be, but while she is walking her grandmother sweeps the floor in front of her to “clear her way”. When the couple is married and everyone has been to congratulate them and the ceremony is done, a cow or sheep will be slaughtered and the meat is equally divided to both the families. Then the fun starts; the music played at Sepedi weddings is normally that of kiba music, which only the men are allowed to dance to. 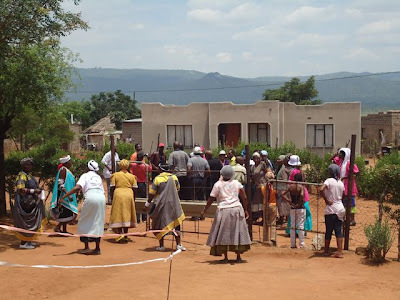 Bride’s mother gives her daughter blanket that she will use to cover her body when she is leaving and her father will lead her to the kraal, and from the kraal they will go straight to the groom's residence and the bride will be advised not to look back. The brides family comes early in the morning so that the bride will steal the gate. The bride enters her husband's home while nobody is noticing her. She enters in the kitchen and seat in the women’s side of the house. Then the groom’s family will pay for not being aware of the bride, they should have stopped her before she enters the house . The groom’s family will welcome the bride’s family and show them the room in which they can stay. In the midday the ceremony will start both bride and groom wear their traditional clothes. Then the couple will go to an open place where they will perform their wedding and dance in a traditional way. After that they will go back home to eat. The bride will give her in-laws the gifts she brought and also the groom’s family will give the bride outfit that she will wear when she enters the kitchen. The bride’s family buys gifts that she will give to her in-laws after the wedding ceremony such as: blankets, Zulu mats, brooms, clay pots, aprons and furniture. She will also buy a box (Kist) where she can put her clothes in and her husband’s gifts. The goat will be slaughtered after the head of the family has spoken to the ancestors that his daughter is getting married. The bride’s father buys a goat that will be used to perform a ceremony which is called umncamo and he want the ancestors to protect her. The family and relatives of the bride give gifts to the bride just to wish her a happy wedding and they advice her to be a good wife to her husband and family. The groom will buy two cows which will be slaughtered on the day of the ceremony. He will also buy a goat that will be slaughtered to welcome the bride. The groom’s family will prepare food and sorghum beer for a special day. 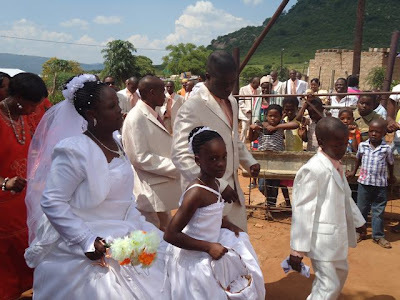 What is a traditional wedding? 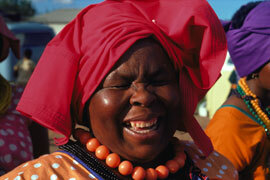 A traditional wedding is a last step after lobola negotiations has been finalized. This kind of wedding involves different cultures. Sometimes traditional wedding can be between two different cultures so those cultures will be represented on that day although the bride will end up following her husbands culture. Who set a wedding date? The groom invites his in-laws to come to his home so that they will discuss the wedding date (Ukubona izinkomo). The groom pays all the cows to the bride's family and then they set a date which is suitable for both families. After they agreed on a date the bride's family will go back home with the cows and start the wedding preparation.